Since the conclusion of World War II, efforts to develop the so-called Third World have taken a variety of paths. In light of the multiplicity of competing theoretical lenses – modernization, post-structuralism, and dependency, to name just a few theories – the field of development is in a state of confusion. 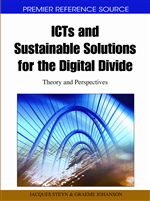 Consequently, it has been difficult for development informatics specialists to understand how best to harness the power of Information Communications Technology (ICT), as there is no clear goal in sight which ICT is supposed to be supporting. The following chapter provides a brief historical overview of the field of development, with a special interest in the role technology has been understood to play in this context. A discussion of relevant scholarship points to the dual notions that the next wave of development informatics work will prize attention to cultural particularities, and as such, will necessitate a degree of participative technology design. By extension, a dynamic relationship between power and knowledge is affirmed, in line with scholars such as Schech (2002). Various strands of thought are ultimately synthesized into what is termed the mirror meta-principle, which stresses that culturally sustainable development informatics requires ICT to be participatively designed so as to support developing societies’ economic and socio-cultural well-being and congruently “mirror” the economic and socio-cultural exigencies and traditions of developing societies. In this paradigm, the economic and socio-cultural patterns embedded into ICT need not be in line, or need to be moved into line, with the traditional Western ideology of modernization. With Heeks (1999), it is asserted that development informatics specialists’ approach to the participatory process must remain grounded in real conditions.